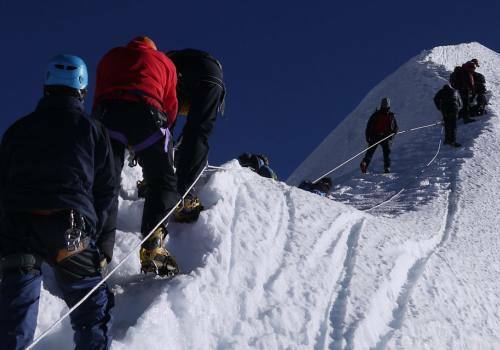 Mera Peak (6470m) is situated in the Sagarmatha Region with an altitude of 6476 meters. 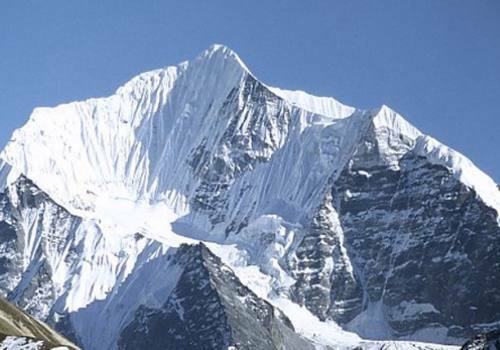 It is one of the highest trekking peaks in Nepal. It is technically easy and entails little more than crampons, and ice axe. Mera Peak lies between the famous peak of Mount Everest and Mont Blanc. It contains three main summits: Mera North (6,476 meters), Mera Central (6,461 meters) and Mera South (6,065 meters) as well as a smaller "trekking summit", visible as a distinct summit from the south but not marked on most maps of the region. Along the way, will show you views of Mt. Everest (8848m), Lhotse (8516m), Cho Oyu (8201m), Makalu (8463m), Nuptse (7855m), Kanchenjunga (8586m) and Chamlang (7319m) amongst many others. The path moves through lush rhododendron, silver fir, oak forest etc. During the trek, you can see Mera Glacier and the striking alpine lake. Also, you will learn about the typical Sherpa culture found in the Solukhumbu. Our trek will begin by moving southeast after a short flight to Lukla. We will walk all along a high, rocky edge through dense forests and cross several rivers before reaching the pass. Then the trail takes us to the rural Honku Valley. 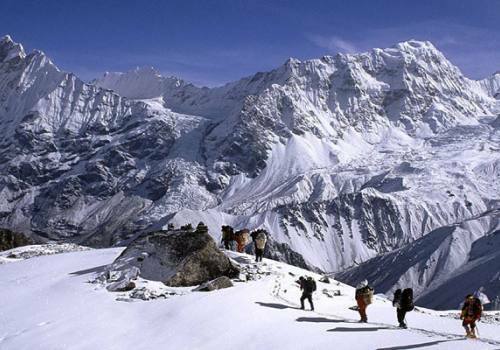 Trekking in this untamed land of the Himalaya is indeed an impressive experience. At Thaknak, we will rest and walk around the giant moraine and the stunning glacial lake lying north of the village. We will move forward to Khare (5099m) and set up camp. Now we follow the glacier that takes us to Mera la (5415m) and on to the high camp of Mera Peak. From high camp, we can witness a magnificent view of Kanchenjunga, Makalu, and Chamlang to the east. To the north we will see Everest and Lhotse and Cho Oyu and Ama Dablam to the west. This view is one of the best in all of Nepal. Then, we will reach the summit of Mera Peak, the ultimate destination of our trek. After that, we will return back down the valley to Lukla for our flight back to Kathmandu. Day 04:Trek to Pangkongma (2950 meter) after crossing Col Khari La (3081 meter), 6 hours walk approx. Day 05:Trek to Kurke (3800m), 5 hours. Day 06:Trek to Thuli Kharka (4200m), 6 hours. Day 07:Trek to Kothe (3800m). 5 hours. Day 08:Trek to Thangnak (4350m), 6 hours. Day 10:Trek to Khare, 4 hours. Day 11:Ascent to Mera Base camp (5200m) via Mera La pass (5415m), 5 hours. Day 12:Ascend to high camp (5780m), 6 hours. Day 13:Summit to Mera peak (6470m) and back to Base Camp, 9 hours trek and climb. Day 14:Extra day to Summit Mera peak just incase of bad weather. Day 15:Trek back to Thangnak. Day 16:Trek to Tashing Dingma. Day 17:Trek to Chetava Kharka. Day 20:Fly back to Kathmandu. Day 01Arrival at the Tribhuvan International Airport (TIA), Kathmandu Upon your arrival at the Tribhuvan International Airport in Kathmandu, the Adventure Himalayan representatives will pick you up and transfer you to the hotel. After refreshment, you will be briefed in short about your tour by our guide or tour leader. If you have any questions or doubts about your trip then they should be asked and clarified at this time. Overnight stay at hotel. Day 03Fly to Lukla (2856m.) and start trek to Chutok La pass (2945m), 30 minute flight and 5 hours walk, After a 40 minute scenic flight from Kathmandu to Lukla, you will trek to Chutok La Pass, which takes about 5 hours. Along the way you can have a view of Mt Nupla (5885m) and Kusum Kangaru (6367m). Overnight at guesthouse. Day 04Trek to Pangkongma (2950 meter) after crossing Col Khari La (3081 meter), 6 hours walk approx.After breakfast, we leave from Chutok La Pass, and cross Col Khari La (3081m) to ultimately reach our destination at Pangkongma (2950m). Overnight in guesthouse. Day 05Trek to Kurke (3800m), 5 hours.Overnight in guesthouse. Day 06Trek to Thuli Kharka (4200m), 6 hours.Overnight in guesthouse. Day 07Trek to Kothe (3800m). 5 hours.Overnight at guesthouse. Day 08Trek to Thangnak (4350m), 6 hours. We walk from Kothe to Tangnang (4356m) today passing all the way through Hinku Valley (4600m). You will be moving all alongside the bank of stream and find bush on both sides. The lane continues to ascending and you can enjoy the scenes of Kusum Kanguru peak and many more. Overnight at guesthouse. Day 09Acclimatization DayThis day will be as your rest day for acclimatization. You can further explore around or climb up for a few hours and again you have to come back to Thangnak for the night. Overnight stay at a tented camp. Day 10Trek to Khare, 4 hours. We trek from Thangnang and walk towards the peak as the route moves to the east. We will reach at Dig Kharka (4,650m.) very near to the foot of the Hinku Glacier. This bestows you with enjoyable and grassy setting. Heading away from Dig Kharka and ascend above (5,000 m.). The track heads toward out of Tangnag alongside the lateral moraine at the Dig Glacier. We will halt to climb up the moraine for a view of the perfect Sabai Tso glacial lake. A move down in lake-level, caused by a current split of the natural dam is clearly visible. We will arrive at Khare in the early afternoon and have lunch. From Khare, the striking north face of Mera Peak view and Mera glacier can be seen. Overnight at guesthouse. Day 11Ascent to Mera Base camp (5200m) via Mera La pass (5415m), 5 hours. 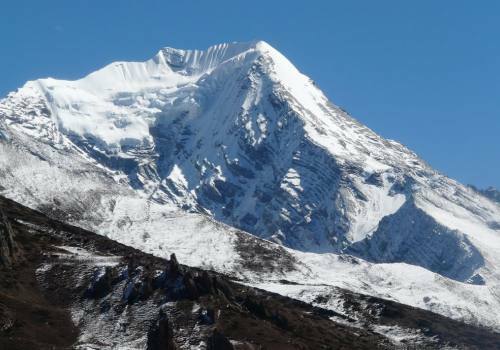 This is another acclimatization day as you can arrange yourself for climbing the Mera Peak. You will observe beautiful and distinctive atmosphere here. Overnight at tented camp. Day 12Ascend to high camp (5780m), 6 hours. Trekking from Khare to Mera High Camp (5780m.) gradually climbing up onto Mera glacier. The go up to begin with vertical, but flattens out as you get to the summit of the glacier. You will go across a long flat on peak of the glacier and then reach at the High Camp (5780m.). From here, the views are eye-catching. The remaining path leads us to the summit of Mera Peak. Overnight at tented camp. Day 13Summit to Mera peak (6470m) and back to Base Camp, 9 hours trek and climb. This area is reasonably covered by ice glacier. The views make you astonished as you can be delighted the Everest, Baruntse, Makalu, Kusum Kanguru and many other panoramic peak views. Moreover, you will be overwhelmed by the wonderful views that will mesmerize you forever. Overnight at tented camp. Day 14Extra day to Summit Mera peak just incase of bad weather.We has set aside a day at the base camp just not to mess up our schedule because of bad day weather. Overnight at tented camp. Day 15Trek back to Thangnak. We move ahead from Mera Base Camp Khare to reach Thangnak and it takes around 8 hours. This day you walk all along the gradual drop path to reach Tangnang. This is a tiny village and you will see yak settlement here. On the way you pass through forests covered with rhododendron, fir and local vegetation. Overnight at guesthouse. Day 16Trek to Tashing Dingma. Full day of trekking. Overnight at guesthouse. Day 17Trek to Chetava Kharka. Overnight at guesthouse. Day 18Trek to Chuthangma. We trek from Chetava Kharka to Chutangma and it takes about five hours. Here, the trail climbs and then you trek downward path to reach Chutangma. On the way, you will walk through rocky lane. Overnight at guesthouse. Day 19Trek to Lukla. We take a trip from Chutangmaa to Lukla and it takes around four hours. You trek all the way through forests of fir, oak, rhododendron, juniper and local vegetation. The track moves downward all the way to Lukla. Here you will get pleasure from the scenes of Numbur Himal, Karyolang peak, Kongdi Ri and many other peaks. Overnight at guesthouse. Day 20Fly back to Kathmandu. After travelling for around 35 minutes, we fly back to Kathmandu, in the morning and move back to the hotel. Overnight at hotel. Day 21Fly back to KathmanduOn the last day you will be thanking the porters, who were a crucial part of the climb. From Lukla, we will take one-hour flight back to Kathmandu. If the flight is on schedule, it is likely to be back at the hotel before noon and you can have a good shower and rest in the afternoon. We'll have a celebratory dinner in Kathmandu. Day 22DepartureWe will transport you to the airport. Thanks for trekking with Adventure Himalayan Travels and Treks. We look forward to seeing you again!